Since 1916, when the first commercial crop of highbush blueberries was sold in Whitesbog, NJ, people have been enjoying the taste and many health benefits of the blueberry. Often referred to as a ‘superfruit,’ blueberries are packed full of vitamins, minerals, and antioxidants. While blueberries boast numerous health benefits, they can also be quite messy and leave your favorite shirt sporting some unsightly purple stains. Don’t toss out your favorite clothes just yet. 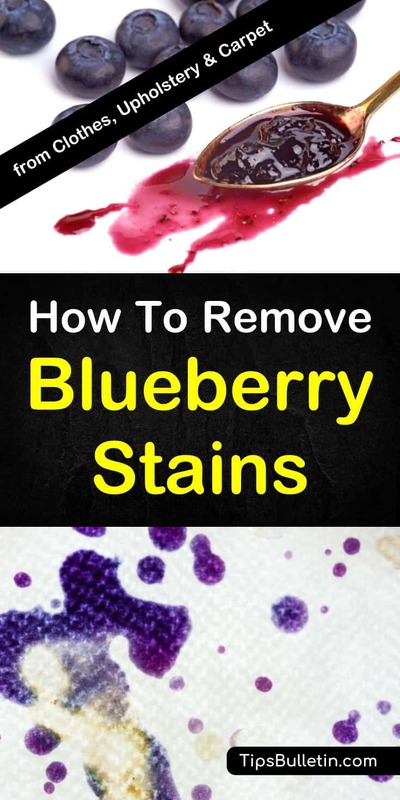 Learn how to remove blueberry stains, not only from your clothing but your carpeting and upholstery as well. The deep blue color of blueberries can cause significant issues if you accidentally get the juice on your clothes. However, the color isn’t the only problem. The sugar content of the blueberries, which makes them taste delicious, can also cause issues if not treated properly. When the natural sugar is left on your clothes, the stain will eventually begin to turn yellow, staining your clothes even more. So, it’s best you treat the original stain immediately to have the best chances of getting the blueberry stain out. Packed with Vitamin C, Vitamin K, manganese, and fiber, blueberries have the highest number of antioxidants of any fruit, due to their many phytochemicals, and their delicious flavor makes them a popular choice for many desserts and treats. Unfortunately, they are also responsible for staining so many of our favorite outfits. Here’s how to remove blueberry stains from all your favorite summer clothing. The first thing that you need to do is read the care label on the garment to ensure the following steps won’t ruin it. Using cold water, flush the stain thoroughly. To have the best results, it is crucial that you do this as soon as possible. Next, mix the vinegar, detergent, and water in a bowl. Place the item in the solution and let soak for 15 minutes. Rinse with cool water. Similar to when you get rid of coffee stains or remove deodorant stains from clothes, if there is still a stain, sponge the area with rubbing alcohol and rinse again. Wash the clothing, using chlorine bleach, if it is safe for the fabric. Nothing is more frustrating than finding a blueberry stain on your upholstered furniture. When this happens, you may think that your furniture is ruined and make plans to head to the nearest furniture store. Before you do, follow these steps to remove the berry stains from your upholstery with this easy to make homemade upholstery cleaner. Scrape off any excess blueberry from the upholstery. Next, in a small bowl, mix the two cups water and tablespoon liquid detergent. Note: Don’t use warm water as it will cause the stain to set into the fibers. Sponge the solution into the stain using a clean white cloth, blotting the stain until all the liquid is absorbed. Using white vinegar, blot the area with a clean white towel. Repeat this process until the stain is eliminated. Once the stain is gone, use cold water, a clean white cloth, and a sponge to remove the residual cleaning solution, and blot dry. Be sure you don’t over saturate the upholstery especially when you clean a microfiber couch; you only need to get it as wet as necessary to remove the blueberry stain. No matter how diligent you are, carpet stains are an inevitable part of life, especially if you have kids. Berry stains, like those from blueberries, can be the hardest to remove if you don’t act quickly. Here is a simple DIY carpet stain remover recipe and by far the best way to remove blueberry stains from your carpet. In a medium bowl, combine the warm water and the detergent. Dip a clean white cloth into the solution and sponge the stain. Blot the stain with the towel until all of the liquid is absorbed. Repeat the process until the stain is no longer absorbed into the cloth or until it is gone. Just like when removing coffee stains from carpet or when you remove mustard stains if the spot doesn’t disappear, mix the ammonia and cold water in a medium bowl. With a clean cloth, sponge the stain with the solution. Again, blot until all the liquid is absorbed. Sponge carefully with cold water and blot dry. Blueberry stains on your fabric and upholstery shouldn’t send you into cardiac arrest. As long as you act fast, you can eliminate those stains from your favorite pieces of clothing and upholstery. As with any cleaning method, be sure to test these solutions in an inconspicuous area to check for colorfastness. 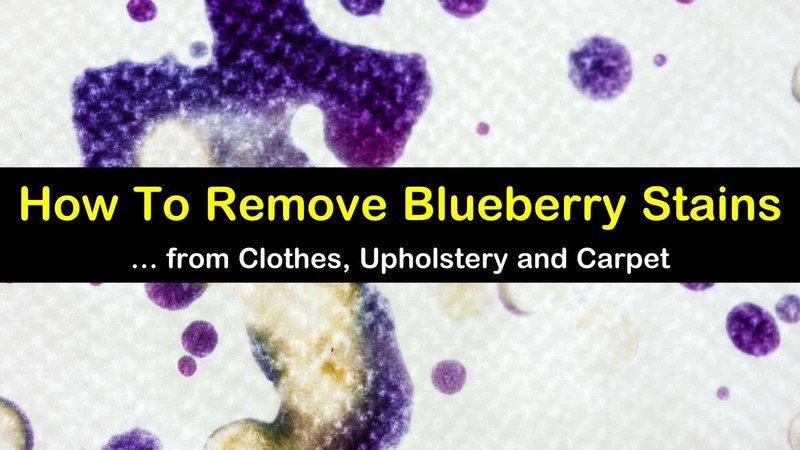 We hope you enjoyed learning about how to remove blueberry stains from your favorite outfits, upholstery, and carpeting. If you liked what you read, please feel free to share with all your family and friends.